I bought this car after having a long happy relationship with a Ford Aerostar. Needless to say, quite an adjustment! Still, the Yaris has its strong points and it has (mostly) won my heart. There'll never be another like my Aerostar, though. Sigh. 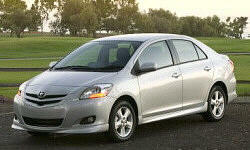 Why the 2008 Toyota Yaris? Have owned this car for almost three years. NO need to go to the shop at all (oil changes and other routine maintenance has been done at home). Have gotten as high as 43 mpg on highway so long as I stay at or below 65 mph. At higher speeds, fuel economy seems to reduce to 39 mpg. I keep the rear seat down almost permanently. Has as amazing amount of useful cargo space for such a tiny car. Why Not the 2008 Toyota Yaris? I simply cannot find a comfortable driving position in this car. If I could raise the seat, I think it would be fine, but seat height adjustment is not available. Or, if the steering wheel could be brought closer, that would work as well. Ha ha ha ha! Perhaps a small dog would be comfortable back there. The only good thing about the back seat is that I've read it is not too hard to remove it entirely! 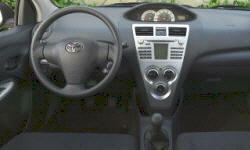 Having the speedometer at the center of the dashboard means that you are reading it at an angle. Thus, when it looks like I'm going 65, if I lean over a bit, I see the needle is actually at 62. Also the GPS confirms that I am indeed going 62.